Proximal chromosome 15q is implicated in neurodevelopmental disorders including Prader-Willi and Angelman syndromes, autistic disorder and developmental abnormalities resulting from chromosomal deletions or duplications. A subset of genes in this region are subject to genomic imprinting, the expression of the gene from only one parental allele. We have now identified the NDNL2 (also known as MAGE-G) gene within the 15q autistic disorder susceptibility region and have mapped its murine homolog to the region of conserved synteny near necdin (Ndn) on mouse Chr 7. NDNL2/MAGE-G is a member of a large gene family that includes the X-linked MAGE cluster, MAGED1 (NRAGE), MAGEL2 and NDN, where the latter two genes are implicated in Prader-Willi syndrome. We have now determined that NDNL2/Ndnl2 is widely expressed in mouse and human fetal and adult tissues, and that it is apparently not subject to genomic imprinting by the PWS/AS Imprinting Center. Although NDNL2/MAGE-G in the broadly defined chromosome 15 autistic disorder susceptibility region, it is not likely to be pathogenic based on its wide expression pattern and lack of imprinted expression. Human chromosome 15q is prone to cytogenetic rearrangements, in part due to repetitive elements located therein [1, 2]. Prader-Willi syndrome (PWS) and Angelman syndrome (AS) are two neurodevelopmental disorders caused by deletions of 15q11-q13, and neurodevelopmental abnormalities are associated with supernumerary chromosomes derived from inverted duplications of 15q . In addition, an autistic disorder susceptibility locus has been localized to proximal 15q by linkage and association studies [4, 5]. AS is associated with UBE3A mutations [6, 7]. Strong candidates for PWS have recently emerged and are likely to have an additive effect in causing this disorder [8–12]. In particular, two members of the NDN/MAGE gene family, NDN and MAGEL2, are located in the PWS deletion region and are inactivated in individuals with PWS [8, 11–14]. Respiratory and behavioral abnormalities in a mouse deleted for Ndn, the murine orthologue of NDN, may suggest that NDN is implicated in the PWS phenotype [15, 16]. We have therefore investigated the possibility that other NDN/MAGE genes may also be present on proximal 15q and may be involved in neurodevelopmental disorders. Indeed, we identified a novel necdin-related gene, NDNL2, on proximal 15q within the critical region for autistic disorder susceptibility. We have examined the expression of NDNL2 and its murine orthologue, and placed the murine gene on Chr. 7. The proximal region of chromosome 15 is subject to genomic imprinting, the expression of a gene from only one allele depending on parent-of-origin. Furthermore, the maternal derivation of chromosome 15 abnormalities seen in individuals with autistic disorder suggests a parent-of origin effect [4, 5]. We have therefore analyzed the imprinting of human and mouse NDNL2/Ndnl2. Using a BLAST search for genes with sequence similarity to NDN, NDNL2 was identified as a MAGE-like protein on the BAC clone RP11-18H24 (GenBank accession AC016484). 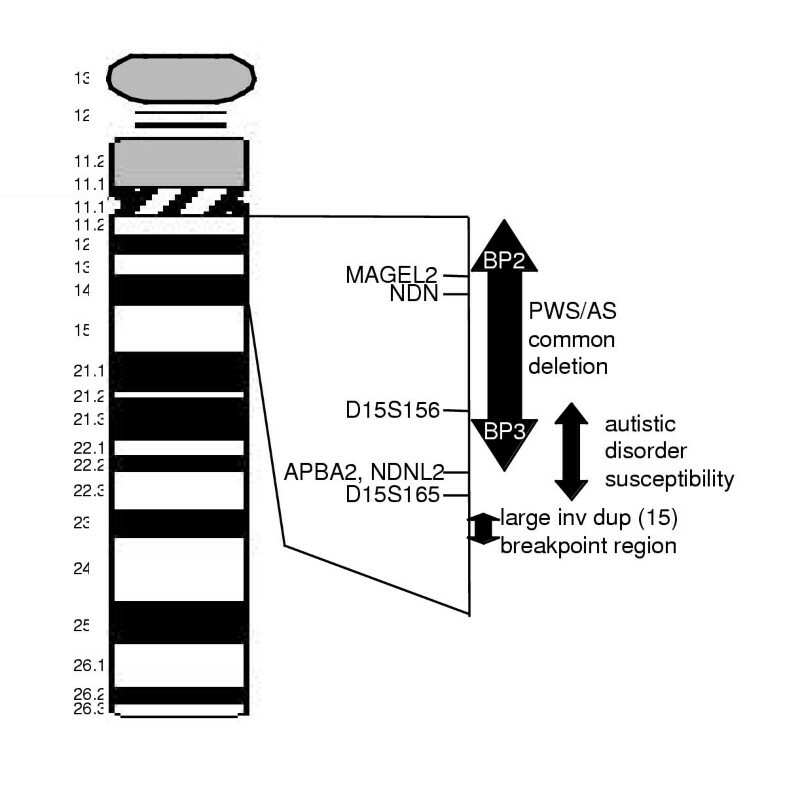 This clone also contains the APBA2 gene which has been physically mapped to within the critical region for a 15q autistic disorder susceptibility locus, and outside the PWS/AS deletion region [4, 5] (Fig. 1). An open reading frame of 472 amino acids was predicted from the genomic sequence of NDNL2 and is located within a single exon of the predicted gene. A series of expressed sequence tags (ESTs) were identified through a BLAST search of the EST database and were found to be part of the Unigene cluster Hs.94011. Assembly of the ESTs into a consensus sequence was performed and this sequence was compared to our sequence of IMAGE clones representing NDNL2 to arrive at a final sequence for the predicted protein (Fig. 2) (also see partial sequence in GenBank AF320911, MAGE-G). Map of the human 15q11-q14 region. Location of NDNL2 was derived from the Ensembl Human Genome server http://www.ensembl.org/ and the physical location of APBA2, which is located on the same genomic clone as NDNL2. The large double-headed arrow indicates the common PWS/AS deletion, and BP2 and BP3 indicate the most common proximal and distal breakpoint regions. The breakpoint region for the largest inv dup (15) chromosome  and the autistic disorder susceptibility region  are also indicated. The physical distance between BP3 and APBA2/NDNL2 is as yet unknown due to the presence of repetitive elements in the intervening region. Sequence comparison of human NDNL2 and mouse Ndnl2 sequence. The human and mouse predicted amino acid sequences are aligned with conserved amino acids shaded. Partial sequence of two cDNA clones has been included for comparison of the predicted translation with the longer human open reading frame. The predicted position of a MAGE-like nonapeptide present in other MAGE proteins is underlined. The sequence for murine Ndnl2 was identified using sequence data obtained from homology searches of mouse ESTs (UniGene cluster Mm.19944). Comparison of the sequence from multiple cDNAs revealed that the predicted mouse protein has 279 amino acids and has 83% sequence identity with the human protein (Fig. 2). As with other NDN/MAGE family members, the maximum sequence conservation is in the C-terminus of the protein, suggesting a common function for this domain among family members. The murine protein is truncated at the N terminus compared to the human protein at the position equivalent to the methionine at position 168 in the human predicted protein, predicted based on the presence of a strong Kozak consensus surrounding the murine AUG, including a G at the minus three position. In at least two EST clones, including RIKEN clone AK010294 from a library enriched for full-length cDNAs, the predicted amino acids upstream of the putative murine start methionine are not conserved with the human sequence, in sharp contrast with those C-terminal to this methionine (Fig. 2). In addition, the lack of conservation does not appear to be due to the presence of an intron or a sequencing error. Closer inspection of the sequence revealed that NDNL2 contains only partial similarity to the antigenic nonapeptide characteristic of other MAGE family proteins (Fig. 2). Ndnl2 is identical in sequence to a predicted protein named "mage-g1" (GenBank accession AF319979). We identified a DNA polymorphism within Ndnl2 by direct sequencing of a 469 bp PCR product amplified from M. musculus strain C57BL/6JEi and M. spretus SPRET/Ei DNA. The presence of a T to C transition at position 42 of AV005659 abolishes an Msp I site in C57BL/6JEi that is present in SPRET/Ei. By genotyping the Jackson laboratory BSS backcross derived from the cross (C57BL/6JEi × SPRET/Ei)F1 × SPRET/Ei), we demonstrated linkage of Ndnl2 to chromosome 7, at a position genetically inseparable from that of Ndn (see Mouse Genome Informatics, http://www.informatics.jax.org/ for details). As predicted from the location of human APBA2 near NDNL2, the murine Apba2 gene is also located in the central region of Chr 7, but the use of different mapping panels for the two genes does not permit their relative order to be established . Based on the high sequence similarity between human and mouse sequences and on the location in a region of conserved synteny we conclude that the NDNL2 andNdnl2 genes are orthologous in these two species. 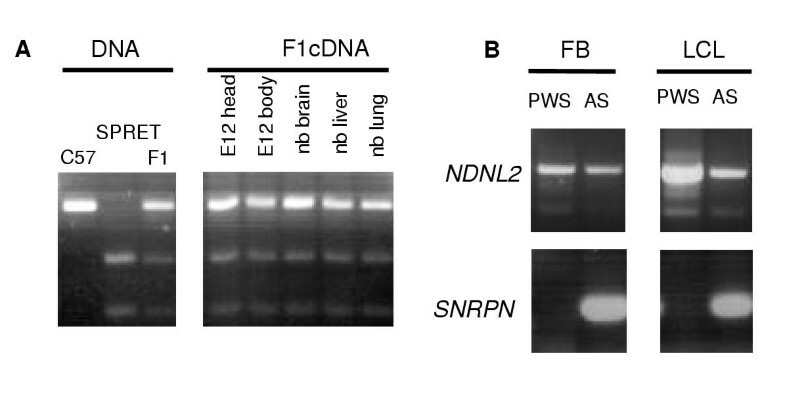 The expression of NDNL2 and Ndnl2 was analyzed by northern blot studies (Fig. 3). The observed 1.9 kb RNA transcript roughly corresponds in size to the 1.5 kb cDNA present in IMAGE clone 1134795, which likely contains most of the transcript. The transcript was observed in all human tissues tested, and appeared to be most abundant in testis after adjustments were made for RNA loading. Expression in mouse is also widespread, with a moderately abundant 1.7 kb transcript observed in all tissues tested consistent with the 1.5 kb insert size for cDNA clone RIKEN ID 1010001J10. The origin of the smaller transcript in mouse testis is unknown but may represent an alternative polyadenylation site or alternative transcriptional start site. It is notable that expression of NDNL2/Ndnl2 is widespread although for other family members, including Ndn, Magel2 and Dlxin, the murine homologue of MAGED1, expression is more spatially and temporally limited [12, 18, 19]. 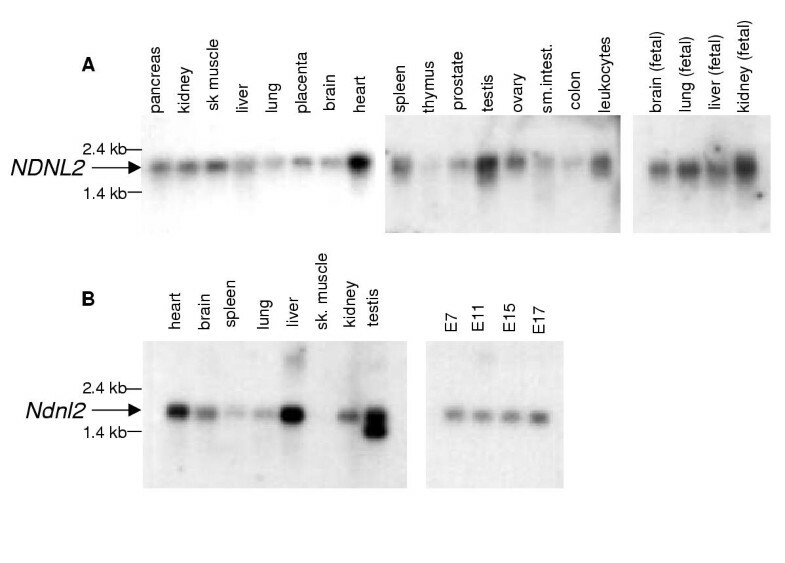 Expression analysis necdin-like 2 in embryonic and adult human and mouse tissues. (A) Northern blots of adult (left and center) and fetal (right) human tissues. The 1.9 kb NDNL2 transcript is indicated by the arrow. Size markers are as indicated. (B) Northern blot of adult (left) and embryonic (right) mouse tissues shows expression of a 1.7 kb transcript (arrow). Previous studies have suggested that the imprinted domain on chromosome 15q is limited to a region of about 1.5 Mb surrounding the imprinting center [20, 21]. However, given the observed parent-of-origin effects in chromosomal disorders of chromosome 15 , we performed experiments to analyze the imprinting of NDNL2 and Ndnl2. To test imprinting of Ndnl2, we examined newborn brain, liver and lung, and embryonic day 12.5 whole embryo RNA samples from the offspring of an interspecific mouse cross for allelic expression using the same murine Msp I polymorphism as used for genetic mapping. Both parental alleles were detected equally, indicating that expression of Ndnl2 is not imprinted (Fig. 4A). We were unable to identify an intragenic polymorphism in NDNL2 that would allow direct evaluation of the levels of expression of each allele. Instead, we evaluated the effect of deletion of the chromosome 15q11-q13 imprinting center (IC) on the expression of NDNL2. Sporadic PWS and AS patients with de novo deletions not only have a loss of the genes located inside the deletion interval, they also have a loss of the imprinting control element located therein. In a previous study, a somatic, de novo deletion of the IC impaired imprinting of target genes . These target genes are not necessarily limited to the region typically deleted in PWS and AS, which is defined by unstable genomic elements located at the deletion boundaries , but could include other genes within the range of the imprinting center. However, our previous study had predicted that it is unlikely that the range of the IC extended beyond the deletion itself . To test this hypothesis and to examine the possibility that NDNL2 is acted on by the IC, we tested the effect of the loss of the IC in sporadic PWS and AS patients on the expression of NDNL2. Using a previously defined assay , RNA from lymphoblast and fibroblast cell lines that carry either a paternal 15q11-q13 deletion (PWS) or the equivalent maternal deletion (AS) were tested by RT-PCR for expression of NDNL2. On repeated trials, both cell lines expressed NDNL2, indicating that NDNL2 is not imprinted by the imprinting center located in the deletion region (Fig. 4B). Imprinting analysis of NDNL2/Ndnl2. (A) Restriction digestion of PCR of genomic DNA from C57BL/6, SPRET and an F1 offspring demonstrating the interspecific polymorphism, RT-PCR of tissues (nb = newborn) from the F1 offspring. Note that both alleles are active. (B) RT-PCR of fibroblast (FB) and lymphoblast (LCL) RNA from PWS, AS and control samples. NDNL2 is expressed in all cell lines whereas SNRPN is not expressed in PWS cell lines (i.e. is imprinted). The names NDNL2/Ndnl2 have been approved by the human and mouse nomenclature committees, based on sequence similarity to NDN and chromosomal localization. In a recent review of the NDN/MAGE gene family, a multiple sequence alignment clustered the chromosome 15 family members (NDN, MAGEL2/NDNL1, and NDNL2/MAGE-G) together with the X-linked MAGE-D, MAGE-E and chromosome 3-linked MAGE-F genes . MAGE-D, known more commonly as NRAGE (human) or dlxin (mouse) may be ancestral to other members of the NDN/MAGE gene family. We recommend that the human and mouse nomenclature committees evaluate the arguments for the names of genes in this gene family to establish a unified nomenclature that clarifies the relationships among the family members. Necdin was originally identified as a gene induced on neuronal differentiation of embryonic carcinoma cells, but has more recently been implicated in PWS. Members of the MAGE gene family are recognized for their expression in tumor cells, and a new family member MAGED1 (NRAGE/dlxin) is postulated to have roles in chondrogenesis, neurotrophin signaling and apoptosis [19, 24, 25]. Although the widespread expression of NDNL2 does not immediately suggest a role in the neurodevelopmental disorders associated with abnormalities of chromosome 15, NDNL2 is located within the broad region associated with developmental disorders. In particular, the location of NDNL2 near D15S1019, proximal to D15S165 implies that copies of NDNL2 are present on most phenotypically relevant inv dup(15) chromosomes [26, 27] and may contribute to the findings in patients carrying these supernumerary chromosomes through a doubling of NDNL2 expression levels. However, NDNL2 is outside the more narrowed interstitial duplication interval associated with some autistic phenotypes , although long range effects on NDNL2 expression may still occur. Given the wide range of processes that members of this intriguing gene family participate in and the possibility of redundant function within the gene family, we suggest that the 15q NDN/MAGE family members be considered as candidates for involvement in the neurodevelopmental disorders associated with chromosome 15q. Human and mouse cDNAs were obtained from Research Genetics or the MRC Genome Resource Facility and were sequenced using the Thermo Sequenase fluorescent labeled primer cycle sequencing kit with 7-deaza dGTP (Amersham-Phamacia Biotech, Buckinghamshire, England) and LiCor technology (LiCor 4200 Automatic Sequencer, Lincoln, Nebraska). The human cDNA was represented by IMAGE clone 1147395; mouse cDNAs were IMAGE clones 483464, 2101532 and RIKEN #1010001J10. A PCR product derived from the 3' end of human NDNL2 was generated with oligonucleotide primers NDNL2-3F (5'-GTCTACCCCACCAAGAAGCA) and NDNL2-4R (5'-CCTTCCCCCAATCCTCTAAA), in a 20 μl PCR reaction containing 20 pmol of each oligonucleotide. The PCR was performed as follows: 94°C for 5 min. followed by 30 cycles of 94°C for 30 s, 52°C for 30 s, 72°C for 30 s, and final extension at 72°C for 10 min., The PCR product was random prime 32P-dCTP labeled with the Random Primers DNA Labeling System (Life Technologies, Rockville, MD). The labeled probe was hybridized to human adult and fetal Multiple Tissue Northern (MTN) Blots (Clontech Laboratories, Palo Alto, CA., Cat. #7760–1, 7759–1 and 7756–1) in ExpressHyb solution according to manufacturer's directions. The final wash was at 50°C in 0.1XSSC, 0.1%SDS twice for 20 min each time. Exposure to Hyperfilm (Amersham-Pharmacia Biotech) was for four days at -80°C. Oligonucleotide primers Ndnl2-1F (5'-CTTGGAGTACCGGAGGATACC) and Ndnl2-2R (5'-CAACACATCCTAACGCTCCA) were used for mouse northern blots. These primers amplified a 343 bp DNA fragment corresponding to the 3' end of the Ndnl2 gene. The PCR was performed as above but with an annealing temperature of 58°C. Mouse adult and embryo MTN blots (Cat. #7762–1 and 7763–1, Clontech Laboratories) were similarly hybridized with the radioactively labeled Ndnl2 1F/2R PCR product. To control for the amount of loaded RNA the same blot was subsequently hybridized with a β-actin or ubiquitin probe demonstrating approximately equal loading in all lanes. A 469 bp product corresponding to the 3' end of Ndnl2 was generated from mouse genomic DNA (C57BL/J or SPRET/Ei) using oligonucleotide primers Ndnl2-7F (5'-TGGAAACCAGCAAGATGAAA) and Ndnl2-8R (5'-AGCTACCCTGTTTCTTTATCGTC). DNA samples were sequenced on both strands using the LiCor automated sequencer. DNA amplification products were digested with Msp I to produce a 469 bp undigested product in C57BL/6J and 180 bp and 289 bp digested products in DNA from M. spretus. Genetic mapping was performed on the Jackson Laboratories BSS backcross. Cell lines used for human imprinting analysis were PWS lymphoblast GM09024B and AS lymphoblast GM11515 (both from the NIGMS Human Genetic Mutant Cell Repository), PWS fibroblast 1889 from the University of Miami Brain and Tissue Bank for Developmental Disorders and AS fibroblast KAT graciously provided by Dr. A. Beaudet (Baylor College of Medicine). ESTs, (expressed sequence tags), IC (imprinting center), PWS (Prader-Willi syndrome). We thank Mary Barter from the Jackson Laboratories for the murine haplotype analysis, the MRC Genome Resource Facility and the RIKEN Genome Science Center for DNA clones, and Dr. A. Beaudet for the AS fibroblast cell line. Samples used in this study were provided by the University of Miami Brain and Tissue Bank for Developmental Disorders through NICHD contract # NO1-HD-8-3284. This work was supported in part by a Research Grant No. 6-FY00-196 from the March of Dimes Birth Defects Foundation, Summer Studentships to T.K.C. from the Alberta Heritage Foundation for Medical Research (AHFMR) and the Canadian Genetic Disease Network. R.W. is a Scholar of the AHFMR and the Canadian Institutes of Health Research. Research involving human subjects and animals has been performed in accordance with the Institutional policies of the University of Alberta.